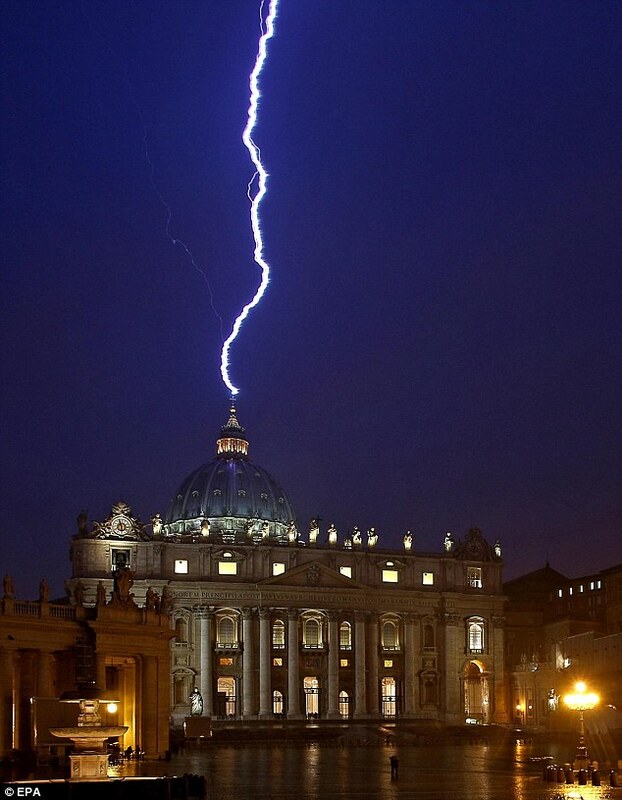 Even though I'm currently on a break from posting, I could no longer bear to stay away when everyone seems to be having so much fun reporting on the lightning bolt that struck St. Peter's Basilica yesterday on the same day Pope Benedict announced his resignation. There are so many things reports are leaving out, that I just wanted to list a few of the things that came to my mind. Again, this is all in fun, but it may be of some interest as well. For his lightning-rod did what exorcisms, and holy water, and processions, and the --Agnus Dei--, and the ringing of church bells, and the rack, and the burning of witches, had failed to do. This was clearly seen, even by the poorest peasants in eastern France, when they observed that the grand spire of Strasburg Cathedral, which neither the sacredness of the place, nor the bells within it, nor the holy water and relics beneath it, could protect from frequent injuries by lightning was once and for all protected by Franklin's rod. Then came into the minds of multitudes the answer to the question which had so long exercised the leading theologians of Europe and America, namely, "Why should the Almighty strike his own consecrated temples, or suffer Satan to strike them?" It was common before the lighting rod for churches to suffer damage during lightning storms. The Church of Rosenburg in Austria suffered destruction by lightning three times until they had enough, and 26 years after Franklin discovered the lighting rod they installed one, preventing any future damage. St. Mark's in Venice has also been struck and damaged on numerous occasions, yet when they installed a lightning rod 14 years after Franklin's discovery, it has never since been damaged. Some see in this a triumph of reason over superstition. 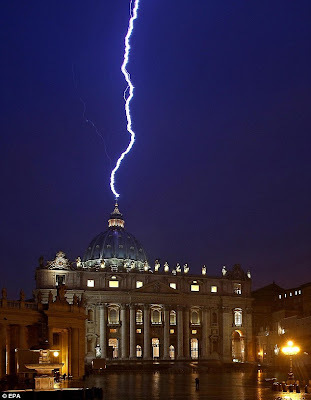 In many ways, it is, but cynics have played on this folly to an extreme for a number of years, asking sarcastically: "Why does the Vatican need lightning rods?" More on this can be read in Franklin's Lightning-Rod by Andrew Dickson White. You can buy your own t-shirt here. Eventually the Vatican did give in to the lightning rod, with two of them in Vatican proper and twelve in the whole area. With St. Peter's massive size, there is no doubt that lightning would strike it often. We actually do know of a few cases in history. The first comes from reports during Vatican 1, on the two most important days of the sessions: December 8, 1869 and July 18, 1870. These were considered the stormiest and darkest days Rome had ever seen. On the first date was the Episcopal Voting of the new dogma of Papal Infallibility, and the second date was the Papal Proclamation of this new dogma. As the votes were taken and the proclamation read, flashes of lightning struck the Vatican and loud clasps of thunder accompanied the reading. It was also reported that a thick envelope of darkness overcame St. Peter's Basilica, to the point where the Pope found it difficult to read the Proclamation of this new dogma without the artificial light of a candle. It was interpreted at the time that this was either a condemnation of Gallicanism and liberal Catholic theology, or a divine attestation of the new dogma in the same way lightning and thunder accompanied the giving of the Law at Sinai, or it was seen as an evil omen of impending calamities to the Papacy. To read the article from the New York Tribune that describes this from an eye-witness, see here. During a violent thunderstorm lightning struck the Vatican Palace, smashing the windows of the loggia in the Raphael Gallery. The Pope, who was working nearby in his private library, was not affected.